Renegade at the throne in Canada! 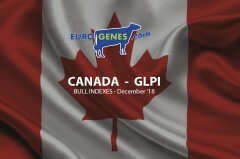 The new Canadian December index run made a lot of increase in GLPI. The new GLPI topper is S-S-I Renegade who rejects Westcoast Horizon of the throne! Renegade is an Altaoak son with +3640 GLPI! Westcoast Horizon loses 31 points and notes +3590 GLPI. The third place is for the Canadian sire Claynook Discjockey with +3584 GLPI. Peak Tropic is new in the top 5 with +3576 GLPI. Sandy-Valley AP Panama (s. Pinnacle) finish the top 5 with +3566 GLPI. The top Conformation list with Domestic daughter proven sires is leading by Bovo Boma and Velthuis SGC Atmost with +16 Conformation. Calbrett Highway, Rickland Altaceo and Mr D Apple Diamondback *RC are sharing the 3rd place with +15 Conformation.